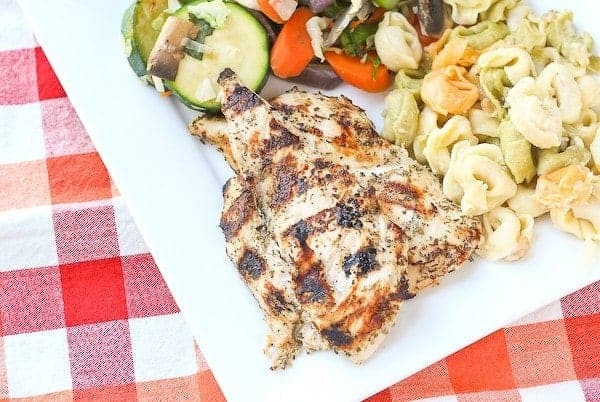 This Greek Style Chicken Marinade is flavorful and made with pantry staples – don’t grill plain chicken ever again. It’s my birthday! I’m celebrating with grilled chicken. Okay not really. I’m celebrating with a work event for Ben. Maybe they’ll bring me cake. Or not. Okay so today’s events might not be glamorous but at least I get to be with my family. And tomorrow my parents arrive to spend a couple days with us. I’m always so excited to see them. My mom and I usually do a lot of cooking together. Ben and I might take advantage of a babysitting offer to snag a date night, or we might just hang out and enjoy the beautiful weather. There was even a mention of them helping us do some landscaping work but I’m not quite sure I want to spend my birthday doing manual labor. Perhaps a manicure would be more appropriate? We’ll probably do the landscaping. Being an adult is so boring. We have some old, ugly bushes in our front yard that just look dated and sad. I want to do smaller, more manicured shrubs. Look, I’m getting that manicure after all! Ha. And truth be told, I might just celebrate with grilled chicken because that means Ben is manning the grill and I have one less thing to cook. 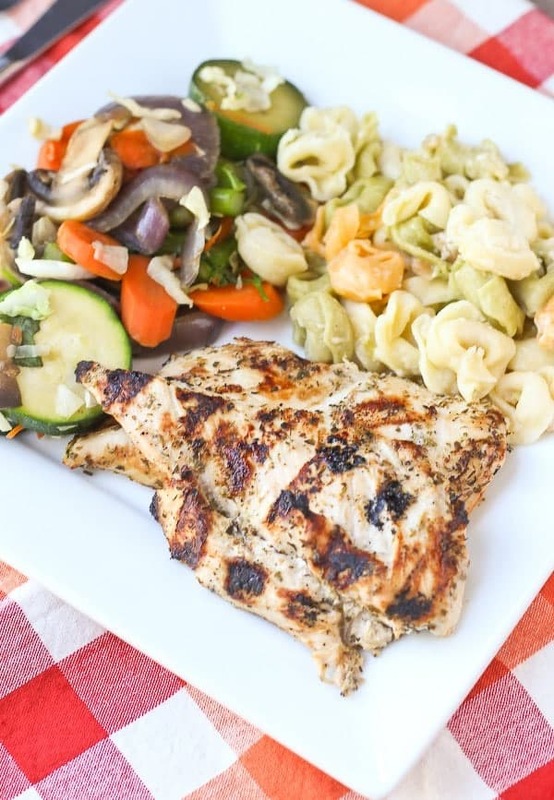 This grilled chicken marinade is one of my favorites because it uses pantry staples. 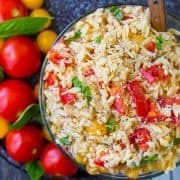 It has the same flavors as my favorite Greek Chopped Salad and Greek Pasta Salad. In fact, those would both be great side dishes. 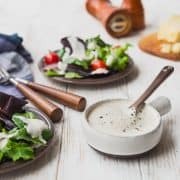 Included in this marinade are red wine vinegar, olive oil, oregano, garlic powder, salt and pepper, and plain Greek yogurt. 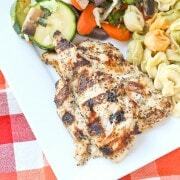 I often use yogurt in my marinades because it makes the chicken extra tender and juicy. It’s a must-have in my marinade for my chicken tawook and it works great in this recipe as well. My birthday wish is that you never grill plain chicken ever again. Please grant my wish. Greek Style Chicken Marinade - perfect for grilling! 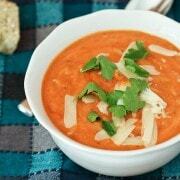 Mix all ingredients together in a bowl or a zip-top bag. Add chicken and marinate for at least an hour or up to overnight. Remove chicken from marinade, wiping off excess with your hands. Grill until cooked through, rest for 5 minutes, serve. Note: Feel free to use fresh garlic. I use garlic powder because Ben doesn’t LOVE garlic so this yields just enough flavor without the punch that fresh garlic gives. Note: I butterfly my chicken breasts to let them really soak in the flavor of the marinade. Husband’s take: Loves it! One of his favorites. Looking for more ways to cook boneless, skinless chicken breasts? Try these: 30 minute Healthy Chicken Stroganoff, Chicken Breasts with Maple Cranberry Sauce, Asian Grilled Chicken, Tequila Lime Chicken Marinade, Cilantro Lime Chicken from Chef in Training, Grilled Chicken with Lemon, Capers and Oregano from Kalyn’s Kitchen, or 15 Minute Chipotle Cumin Grilled Chicken from Simply Scratch. There are pin buttons on the upper left hand corner of each image if you hover over them, and there are also sharing buttons at the bottom of each post. Are you viewing on mobile or on a desktop computer? I cook my chicken skin side up on the cooler side until it’s around 120°F or so, then flip it over to the hotter side with the skin down and continue cooking until the skin is fully crisp and rendered and the meat hits that 150°F sweet spot. You know that movie about the nerdy kid who nobody notices at school until the day she does up her hair, puts on a dress, takes off her glasses, and becomes the prettiest girl at the prom? So I’m way behind on my blog reading and just got to this one. I have to say, as a parent at your husband’s school, we really appreciate how invested you both are in coming to events. I was surprised to see you there on your birthday, but it also showed me how much my child and the others in the school really mean to him. I hope you were able to enjoy some of the goodies that were out as a little birthday treat that day. Thank you for always being so supportive of our kids. This chicken looks amazing…..will definitely make this!! And happy belated birthday to you!! Oh I love that you used yogurt as part of your marinade! This sounds way too easy! Pinning for sure. Hope you have a lovely Birthday!! Makes me wish we had a grill. Must be so tasty, using this on our next grilled party! Your chicken turned out so perfect! Happy Birthday!! This chicken marinade is PERFECT! Packed full of wonderful flavor. Happy birthday! Looks good, and thanks for the shout-out. I am in love with Greek flavors. Ugh one year I agreed to do some landscaping on my birthday and I am still annoyed about it. Maybe put it off til tomorrow?